Exercise is an important part of healthy living. Depending on your fitness level, or your overall health, in can seem hard to incorporate exercise into your daily routine. 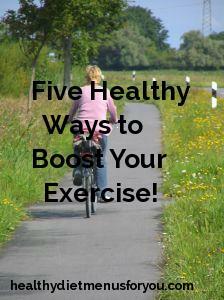 Increasing the amount of exercise that you do should be a gradual change. Increasing your exercise level too quickly could result in injury. Especially if you are moving from a very sedentary lifestyle to an active one, you do not want to try to do it all at once. A great way to increase exercise and enjoy doing it is to take daily walks. Going for a nice long walk is an excellent way to relieve stress, start your day, or even spend time with loved ones. Consider getting the whole family involved and take a walk at the end of the day to spend time together and talk about your days. Or, get your friends together and start a walking club. Having some conversation with friends and family can make exercise fun and help you stick to it. If you spend a lot of time working at a desk or just want to make the most out of the time you spend sitting down to watch television, you can exercise in your seat. Swimming is an excellent and low impact workout that can be done at any pace. You can start off with some slow laps and gradually improve your stroke, or take a water aerobics class. Going to a pool with your friends or family is often a great way to get in some fun and increase exercise. When you are playing around in the pool, you sometimes won’t even notice that you are getting a workout. Doing some simple bends and stretches throughout the day can help you stay limber and less sore as you gradually increase your exercise levels. Start your day with some stretches and side-bends to wake up your muscles and get them ready for the day. Always remember to stretch before you do anything physical, even if it’s just going for a leisurely walk. Doing something fun for exercise is a great way to increase your physical activity and maintain it. Consider taking a fun dance or aerobics class, or get together with friends to walk or exercise. Having fun while you are working out will help take your mind off the exercise and allow you to enjoy yourself in the process. Whatever you choose to do, make sure you are increasing your exercise levels gradually. Even if you exercise regularly and are just looking to do more, you can prevent injury and burnout by incorporating more physical activity slowly. For more information check out my other posts.